Photo Credit: Maj. Thomas Cieslak (USASOC). One of the Western Hemisphere’s most enduring security partnerships strengthened in late fall as counter-narcotic police from Colombia trained with Green Berets from the United States here in Northwest Florida. Members of the Compañía Jungla Antinarcóticos, trained in November with Special Forces soldiers, of the 7th Special Forces Group, or SFG, (Airborne), improving their capacity to counter narcotic and human trafficking in their home country while reinforcing bonds between the two forces. The partnership was established in 1989 when the first 120 Junglas were trained by the British Special Air Service with support from members of the 7th SFG (A), the Army’s Special Forces Group, whose area of responsibility, or AOR, includes Latin and South America. The Green Berets were given the primary responsibility of training the Junglas early in the 1990’s, forming a relationship that continued to develop throughout the decade. Junglas now comprises most of the training cadre as the 7th SFG (A), along with other U.S. agencies, continue to sustain the partnership and provide training and advisory support. Charged with seeking out and destroying narcotic-production facilities hidden beneath the dense canopy of the Colombian jungles, Junglas are experts in jungle warfare. Each member undergoes 18 weeks of training conducted by Colombian, and sometimes American, instructors in the use of small arms, demolitions, first-aid and many other skills necessary to fight an enemy, who can easily meld into the dense vegetation used to conceal facilities and storehouses. Speed and determination are the two characteristics that best describe assaults Junglas conduct against targets equally determined not to lose a lucrative source of income. Transported to their objectives in armed helicopters, they often must rappel to the ground because there is no area suitable to land the aircraft. At Eglin, the Junglas paired with a 12-man team known as an Operational Detachment Alpha, or ODA, whose members’ specialties include demolitions, tactics, leadership and planning. Speaking to the Junglas in their native language, the Green Berets immediately developed a rapport with the Colombians and developed a training schedule to improve their capacity to counter the narcotics trade in their home country. The Junglas’ training began with techniques in basic marksmanship for carbine rifles and 9mm pistols using static targets on Eglin’s open-air ranges. From those basic methods, the Green Berets increased the difficulty and intensity of the training by including movement and team-level tactics while still using open-air ranges with static targets. A few days of the month-long training were devoted to familiarizing the Junglas with weapon systems they might not operate regularly, like mortar systems and sniper rifles. 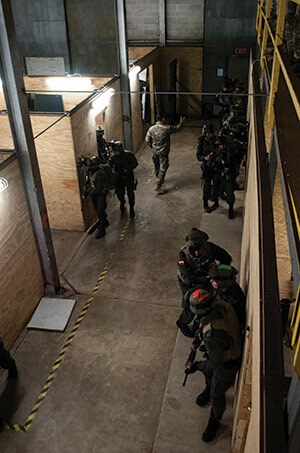 The Junglas spent the third week of the month inside the rooms and hallways of a shoot house located on the 7th SFG (A) compound learning close quarters battle skills. Able to have its layout reconfigured due to movable doors and walls, the shoot house offered the Colombians nearly endless challenges in learning CQB techniques from the Green Berets who took measures to ensure complacency and familiarity did not cloud the Junglas’ judgment or learning. The training was a first for both members of the decades-long partnership. In the past, Special Forces soldiers tasked with partnering with the Junglas would prepare at and deploy from their home station of Fort Bragg, North Carolina, or more recently, Eglin, after the group’s Defense Base Closure and Realignment Commission mandated a move. Training in the highly specialized facilities appealed to both partners. The Junglas conducted a culmination exercise requiring them to apply skills taught to them by the Green Berets in the prior three weeks. While ensuring the safety of all participants, the soldiers mostly observed the Colombians’ actions and planning, only offering insight or correction when necessary. The Junglas’ final objective of the exercise, gleaned from intelligence gathered at three previous targets, required them to cross Santa Rosa Sound on Zodiac rigid inflatable boats and conduct a nighttime raid on a suspected safe house. Moving quickly across the sand and roads of Santa Rosa Island, the Junglas assaulted the multi-story building intent on rescuing simulated hostages. Observed by their Green Beret mentors, the Colombians quickly swept through multiple rooms and hallways, shouting amidst the chaos to communicate their actions and prevent fratricide. With the building secure and the simulated hostages not apparently present, the Junglas began a comprehensive search of the complex, eventually finding the role-playing victims stashed inside a hidden room. During a ceremony concluding the training, American and Colombian leaders expressed how grateful they were for the opportunity to train with a force long understood to be their partner. For the Colombians, the ceremony marked one of their last tastes of American culture during the training event.